Russia, the US and the UN have agreed that the only solution to the ongoing Syrian crisis lies within the framework of the “Geneva-2” peace talks, Russia’s Foreign Ministry said in a statement. After their meeting in Geneva on Friday, Russian Foreign Minister Sergey Lavrov, US State Secretary John Kerry and UN and Arab League Special Envoy to Syria Lakhdar Brahimi “reaffirmed their commitment to an early launch of Syrian dialogue in Geneva between representatives of the Syrian government and main opposition groups," Russia’s Foreign Ministry said. The meeting between Lavrov, Kerry and Brahimi in Switzerland was focused on “practical issues” to prepare the way for an international peace conference over Syria. The three diplomats agreed that “a political settlement is the only possible way to an early end to violence in Syria and to overcome acute humanitarian consequences of the Syrian conflict,” the Russian Foreign ministry said. This settlement should be “based on the implementation of all provisions of the Geneva communiqué of June 30, 2012,” the statement said. The representatives of Russia, US and UN decided to meet for trilateral talks at the next regular session of the UN General Assembly in New York on Sept. 17. Kerry said another meeting is needed to set the date for organizing the “Geneva-2” peace conference. Commenting earlier on Friday’s Geneva negotiations, called to establish international control over Syrian chemical weapons, Kerry said the dialogue “was constructive, it continues." "We are working hard to develop a common position," he said. Earlier Friday, the head of the UN chemical weapons inspection team, Ake Sellstrom, said that the UN report on the alleged use of chemical weapons on August 21 in Syria was complete and would be delivered to UN Secretary General Ban Ki-moon over the weekend, AP reported. The US is confident that the results of the report will “reaffirm that chemical weapons were used in Syria” without assigning blame on any of the conflicting sides in the Syrian civil war, State Department spokeswoman Marie Harf said Friday. President Barack Obama also reiterated that any agreement on Syria's chemical weapons needs to be verifiable and enforceable. The talks between Russia and the US kicked off in Geneva late Thursday, with Lavrov saying a military strike was unnecessary once Damascus agreed to put its chemical weapons under international control. However, Kerry said that “words are not enough,” doubting that Assad’s government was serious in its intentions give up its chemical weapons. The negotiations will continue on Friday night, said the spokeswoman for Russian Foreign Minister Sergei Lavrov. "We are staying, probably they will finalise it through the night," she told reporters in Geneva. "I am not sure about tomorrow (Saturday), but they will go through the night." "It is a sign that we are going on, that we proceed with talking and negotiating. Now it is like a real negotiating process, they are working on some real substance," she added. Lavrov and Kerry plan to continue their talks in Geneva on Saturday, RIA Novosti cited a source in the Russian delegation as saying. Syria “legally” became a full member of the global anti-chemical weapons treaty on Thursday, after President Bashar Assad signed a legislative decree that "declared the Syrian Arab Republic approval to accede to the convention" and that Syrian Foreign Minister Walid Moualem had written to the Organisation for the Prohibition of Chemical Weapons (OPCW), said Syria’s UN Ambassador Bashar Jaafari. 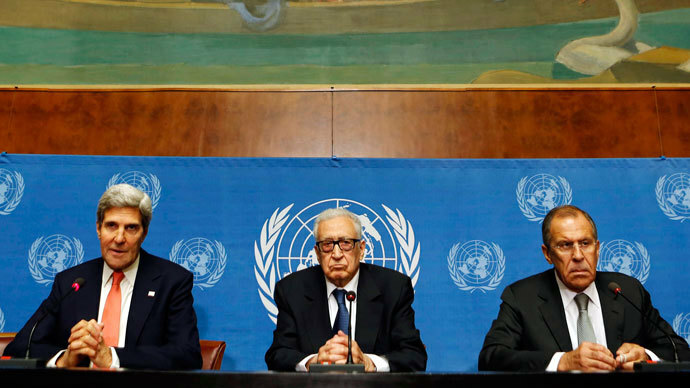 However the UN has said that Syria's application is not yet complete, declining to answer what information was missing. OPCW is due to consider Syria’s inquiry in the following week. Syria was one of only a few countries not to have joined the 1997 Chemical Weapons Convention, an arms control agreement which outlaws the production, stockpiling, and use of chemical weapons. The alleged chemical weapons attack after which the diplomatic scramble to avert military intervention in Syria began, occurred on August 21 in Ghouta, an eastern suburb of the Syrian capital Damascus. The reported casualty figures ranged from dozens to almost 1,400 deaths. Following the incident several videos showing alleged victims of the attack emerged online. The incident occurred a few kilometers from the temporary quarters of the UN team of investigators which was in the country at Syria's invitation to look into several previous alleged uses of chemical weapons. Both sides of the ongoing Syrian conflict – the Assad government and various opposition groups – have denied their participation in the alleged chemical weapons’ attack, blaming each other.